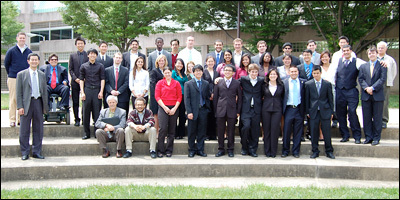 The Class of 2011 with BioE faculty and mentors. Smartphone-based solutions, diagnostics, wound care and new surgical techniques were on display as bioengineering seniors presented their final projects at the Capstone II finale, held May 11, 2011. Teams discussed the results of two semesters of research and testing, outlined challenges and successes, and demonstrated their prototypes. Mrs. Susan Fischell is the creator and sponsor of our annual Capstone Design Awards. In this competition, launched in 2009, the top three project teams as selected by a panel of judges win monetary prizes donated by Mrs. Fischell and are invited to present their work to the public at the Fischell Festival. 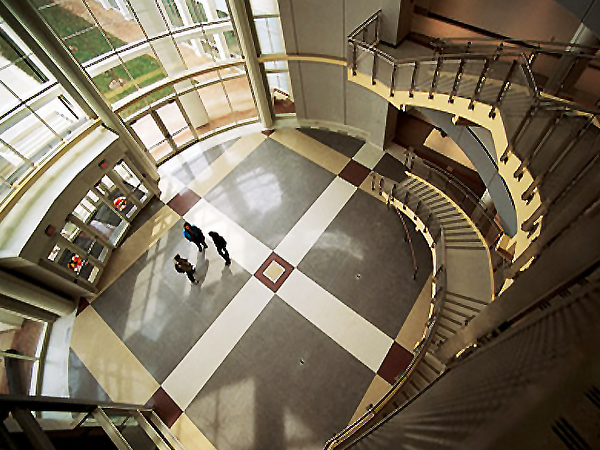 The teams may also have the opportunity to have their inventions put on track for development at the Robert E. Fischell Institute for Biomedical Devices. 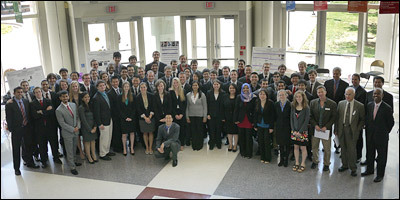 Winners of the 2011 Capstone Design Awards are noted in the project descriptions below, and links to videos of the winning teams' presentations are also provided. Alcohol plays a role in one third of all traffic deaths, costing thousands of lives and billions of dollars in damage and medical expenses every year. Team 1 designed BACHomeSafe to help people determine their blood alcohol content (BAC) before they head for the car. The two-part system uses an inexpensive, portable breath alcohol analyzer to send its results wirelessly to any Android-based smartphone running the BACHomSafe app, which is also capable of tracking results over time. Team 1 says their system will help people avoid excess drinking, make responsible decisions about when to stop and whether to drive, understand BAC and impairment levels, and automatically call friends, a taxi, or even an ambulance if necessary. A pulse oximeter is a device that indirectly measures the oxygen saturation of hemoglobin based on the color of the blood it "sees" when a light is shined through an area of skin. It is used to monitor a patient's condition during and after surgery, or in cases of cardiac distress. Team 2 discovered that this essential piece of medical equipment is present in only five percent of operating rooms in third world countries. Existing portable units require external power sources (which may not exist in facilities off the grid), cannot store patient data, and typically retail for more than hospitals in impoverished nations can afford. To solve the problem and meet a global need, Team 2 designed an inexpensive pulse oximeter that connects to a smartphone using its standard audio jack. The device amplifies and modulates the oximeter's DC signal, converts the voltage to an analog frequency signal, and sends it to the phone. An app running on the phone interprets the changes in dynamic frequency, calculates the patient's pulse and oxygen levels, and displays the information. The data can be saved for future review. Mentor: Dr. Ramesh Patel, M.D. Electrocardiograms (ECG, EKG), which display a record of the heart's electrical activity, are used to search for abnormalities or monitor a patient's condition after a heart attack. Most existing technology involves larger pieces of equipment with wire leads, and data output to paper. These devices, made by multiple companies, do not share a common platform, so data cannot be exchanged between brands or easily transferred between emergency response teams and the hospital. Team 3 set out to solve these problems by creating a noninvasive, completely wireless system based on the Android operating system platform. LifeBeats records a patient's EKG using a small, lead-less monitor worn against the skin, and can send the data to any one of the millions of Android-based smartphones and tablet computers, providing a consistent, easy-to-use interface, reducing costs, and enabling different teams of providers to quickly share patient data. Mitral valve repair is an open-heart surgery that corrects the narrowing or leaking of the inflow valve that conducts blood from the left atrium to the left ventricle. In order to repair the valve by replacing its chordal apparatus (the elastic "heart strings" that support it) with GORE-TEX® sutures, a surgical team must cut through a patient's sternum and stop the heart. Team 4 hopes to drastically reduce the risk, difficulty, cost, and recovery time associated with the procedure by creating a tool that would allow surgeons to perform a minimally invasive, heart-beating repair with the same results as conventional surgery. They designed a patent-pending, hollow needle made out of a deformable, shape-memory alloy called nitinol. The needle enters the heart through a catheter, which is inserted into the patient using only a small incision. The needle pierces the valve leaflet while straight. In response to a change in temperature, the needle makes a U-turn and pierces the heart again. The suture material is drawn through this curve and out a hole in the apex of the heart. Another change in temperature straightens the needle and allows it to be withdrawn. The slack is pulled and the suture is tied off at the correct length, leaving a stitch behind. Bone marrow biopsies are used to diagnose certain cancers, blood disorders, infections, and anemia. After numbing the patient, a hollow needle is inserted at the hip or sternum. When it reaches bone, it is twisted until it bores through, so a core sample of marrow can be collected and removed. About 700,000 of these procedures are performed in the U.S. each year, and many of them encounter problems: osteoporosis or obesity may make reaching marrow difficult, the sample may be contaminated by muscle cells, or the sample obtained might not be large enough. Team 5 invented MarrowScope, a fiber optic cable system threaded through the biopsy needle, to help doctors determine what tissue is being penetrated and collected, improving the procedure's chance of success. MarrowScope works by measuring the unique amount of light each tissue type reflects. The device has a high level of sensitivity, is resistant to electromagnetic interference from other equipment, is cost-effective, and can be scaled and adapted for other types of biopsies. Using Android-based smartphones and Bluetooth devices, Team 6 created a new assistive alert device for the deaf and hearing impaired, designed to compliment existing means of communication and provide a discrete alternative for those unwilling to wear a hearing aid. Their solution, E.A.R., combines the Android operating system's native voice recognition and speech-to-text features with a specially designed app that analyzes ambient noise for predetermined words or sounds, and sends a vibratory alert to a Bluetooth-enabled bracelet when they are "heard." In a demonstration of their prototype, the team showed how the E.A.R. could alert its owner that someone was calling his or her name, something that might otherwise be difficult to accomplish in a crowded public setting. The device can recognize names used in different contexts, such as "Susan," "Mrs. Smith," and "Mom." The team plans to add recognition of "emergency sounds" to future versions of the E.A.R, such as sirens or horns, which will give its users increased awareness of their surroundings and promote safety. The E.A.R. is easy and inexpensive to implement using existing technology, provides a low cost mechanism for data transfer, and has few privacy concerns because it is designed to listen to and filter sounds in public situations. Blood clotting, a natural part of wound healing, may occasionally cause complications after an injury or surgery. Excessive clotting can lead to blockages in blood vessels, resulting in embolisms, deep vein thrombosis, or a stroke. Each year, hundreds of thousands of patients using the drug Warfarin, an anti-coagulant, must be closely monitored due to its small therapeutic range and its potential to cause its own dangerous side effects. Patients come in for special blood tests two or three times week while using Warfarin, and their doctors may wait up to a week for the results of each test. 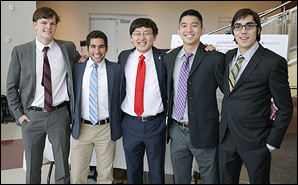 Team 7 created CoagCapture, a portable, at-home testing device for patients using Warfarin. CoagCapture almost immediately displays blood test results and transmits them from the patient's smartphone to the doctor's, reducing the time, effort, delays and cost associated with monitoring the drug's effects. The device uses a combination of a heated test strip, a signal circuit, and the phone's audio output and input to measure the electrical impedance of the blood and report the results to an app on the phone. The team estimates the device will cost $900-$1100 less than existing comparable portable systems. Monitoring kidney function is not only important to those living with renal disease, but also to patients at risk of kidney failure after surgery. The most common method of assessing kidney health and function is to analyze a urine sample, which requires turnaround time and yields varying results based on the patient's metabolism, diet, and blood flow. To help doctors monitor post-operative patients, and to assist those engaged in related research, Team 8 designed a minimally-invasive delivery device for an existing fiber optic bioprobe, Oxford Optronix's OxyLite, that would allow kidney health and treatment efficacy to be monitored in real-time, without the need to collect and process multiple urine samples. The device uses a nested needle design, a delivery mechanism already familiar to many doctors. The outer needle is inserted through a small incision in the patient's back and guided via ultrasound to his or her kidney. Once it arrives, its inner needle penetrates the organ's cortex and proceeds inside. The outer needle is withdrawn and the thin fiber optic wire bioprobe is guided to its destination through the inner needle, which is also then removed. The bioprobe can remain in the patient for three to five days after surgery. When no longer needed, it can be gently withdrawn from the body through the original small incision. In addition to reducing risk of kidney failure, Team 8's device, which is compatible with other kinds of bioprobes, could be used to monitor drug efficacy, assist in planning and guiding roadiotherapy for cancer patients, and save time and money. Joshua Hoffman, Tyler Keay, Natan Simhai, and Andrew Zayac. 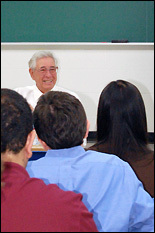 Mentor: Dr. John Arnold, M.D. Heart-monitoring implants and wearable devices used by high-risk patients are capable of sending warnings and data to doctors and patients. Their ability to continuously monitor the heart's electrical activity (electrocardiogram, or ECG) and log abnormalities has allowed them save lives by warning of heart attacks before they occur, and by drastically shortening the time between the detection of a problem and medical intervention. Existing devices for monitoring a patient's ECG, however, either do not have a user interface, or can display but not transfer data. Team 9, like their colleagues in Team 3, took a new approach to the concept by combining a noninvasive ECG monitor with a smartphone application and a remote web site that can be used to display and analyze data in realtime. Their prototype processes and transmits ECG information from the patient using existing Bluetooth wireless technology to any Android-based smartphone. A custom app on the phone both displays the ECG and sends the data to a web site, allowing doctors, patients, caregivers and EMTs to access the information immediately from almost anywhere, or to review logged data. The phone running the ECG app detects the wearable device's Bluetooth hardware automatically within a range of ten meters. Team 9 believes their combination of a wearable device and near-ubiquitous use of cell phones and web sites can now make this life-saving technology available to an entire at-risk population. Exercise associated muscle cramping (EAMC) results from a combination of strenuous exercise and a decrease in fluids and electrolytes. Noting that all current treatments for EAMC are designed to be used before or after an activity, often creating a painful delay in treatment, Team 10 created a wearable biomedical device capable of sensing and responding to an individual's muscle cramps as they occur. Their prototype takes the form of a sleeve worn on the calf, a common cramping site. The sleeve is equipped with surface electrodes that create an electromyogram (EMG), a record of the electrical activity generated by a muscle as it expands and contracts. The signal generated by these changes in voltage are conditioned and sent to the sleeve's microprocessor, which determines whether a cramp is in progress. If a cramp is detected, the microprocessor sends electric pulses to shape memory alloy components within the sleeve, arranged in a formation called a NanoMuscle. The current causes the NanoMuscle alloy to expand and contract down the length of the sleeve, simulating a massage and immediately helping to alleviate pain and discomfort. 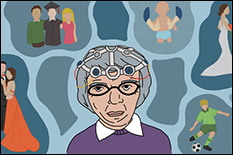 The device is trained to respond to its individual wearers. Before use, an athlete produces a baseline EMG to determine his or her muscles' states of relaxation and maximum contraction. Based on these measurements, the sleeve will activate only if a contraction occurs that exceeds an intensity unique to the individual, and is sustained for a specific period of time. Team 10 designed a patent-pending medical device that could reduce or prevent the swelling, scarring, and infections that are sometimes associated with the stitching and stapling of surgical wounds or cuts. The system's noninvasive, needle-free technology also eliminates accidental needlestick injuries during treatment, which in turn prevents the transmission of diseases including hepatitis and HIV between patients and healthcare providers. The product's design uses a combination of a flexible frame and sterile medical adhesives to gently draw the edges of an open wound together. The tension is entirely on the device and healthy areas of skin, not the wound itself. 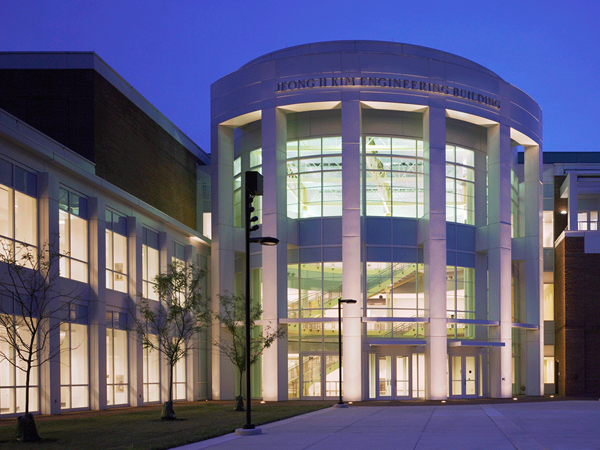 Team member Jin Xiao presented the device at the University of Maryland's 11th annual $75K Business Plan Competition, where it won first place in the Undergraduate Division and $10,000 for future development. We wish all of our seniors the best! We're sure innovative engineers like these will succeed wherever they go. Our seniors would like to thank their professors and mentors (listed with their Capstone teams above); lab staff including Melvin Hill, Ali Jamshidi, and Gary Seibel for guidance, time, and labor; administrative staff members for help with financial support and purchasing; Professor and Fischell Department of Bioengineering Chair William Bentley; and friends in outside academia and industry for the advice and supplies they donated that helped these projects succeed. The Fischell Department of Bioengineering and its students would like to thank Mrs. Susan Fischell for her sponsorship of the Capstone Awards, and our panel of judges: Professor Leigh Abts (College of Education/BioE), Brian Lipford (Partner and VP of Strategic Initiatives, Key Technologies Inc.), and Dr. Jafar Vossoughi (President, Biomed Research Foundation and adjunct faculty, BioE).